Hello Spring Summer 2012 from Casadei. Neon Sky High is what He calls these wedges. 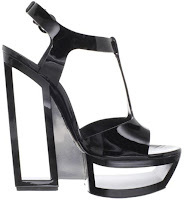 Heel height: 6.2 Inches, Platform height: 2.0 Inches. Pretty sure we have featured Casadei before and after doing a quick browse, the shoes are awesome, gotta shell out $600-$1200 for a pair, but hey ya ain't gonna see these walking down the street everywhere. Must have these! Do you have $600+ to spare for me?